We have gained planning permission for this luxury new-build house on Squirrel Walk in Little Aston Park, Sutton Coldfield. We were commissioned by the owners of the plot, which is situated within Little Aston Park, to draw up a design for a new luxury home to replace the bungalow which currently occupies the site. The owners wanted a large house with a commanding presence but one that would fit in well within the context of this wooded area of Roman Road. We have created a new house in excess of 5500 square feet and although a dominant form will be created, as is the trend in this location, we have tempered this by creating a series of projecting bays to the front, and lower forms to the sides. This helps to give the building an elegant feel and will see it integrate well with the surrounding dwellings. The house, although traditional in shape and form will have contemporary touches, with an oak framed projecting entrance bay. A heavily glazed rear elevation is where the main living spaces and master bedroom are placed in order to take in the views over Little Aston Lake and the Westerly aspect. This scheme gained planning permission in November 2013 and is currently under construction. 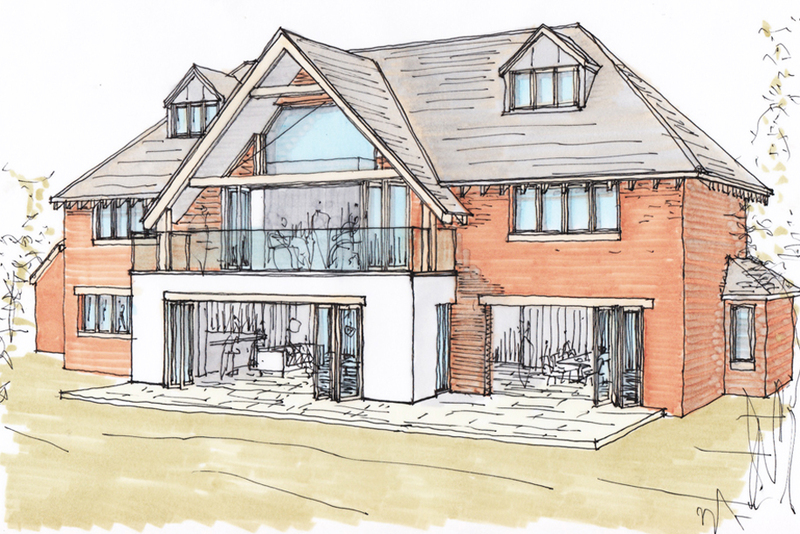 The image above shows the proposed rear elevation.